Travel through time and explore the rich and cultural Santa Monica history, from the discovery of Santa Monica Bay to the expansion of the Metro Expo Line from Downtown Los Angeles to Santa Monica’s shores. We will answer questions like; How did Santa Monica get its name? When did Santa Monica Pier first opened its doors to visitors? When was the city of Santa Monica founded? 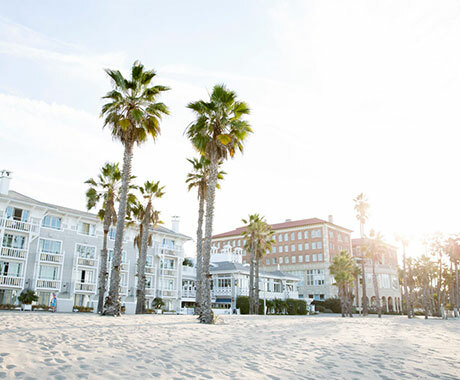 Or how a private Santa Monica mansion becomes one of the city’s most famous hotels. Juan Rodriquez Cabrillo drops anchor in Santa Monica Bay. Father Juan Crespi, a Franciscan in Gaspar de Portola’s expedition party, names the area after Saint Monica. Saint Monica’s fertile open country remains under Spanish rule. Mexico, free of Spain, divides the area into three expansive land grants called Rancho San Vicente y Santa Monica, Rancho Boca de Santa Monica and Rancho La Ballona. Col. Robert S. Baker of Rhode Island purchases 38,409-acre Rancho San Vicente y Santa Monica for $54,000; wife Dona Arcadia de Baker buys what is now Pacific Palisades for $40,000. Nevada Senator John Percival Jones, regarded as the founder of Santa Monica, purchases control of Rancho Santa Monica for $162,000. Santa Monica takes shape; Colonel Baker and Senator Jones plot the city’s physical layout, including ample parks. Senator Jones donates 26-acre Palisades Park to the city; the first residential lot sells for $300. The seaside sanctuary’s population grows to 1,000 in nine short months. The city of Santa Monica is incorporated – all 8.3 square miles. Senator Jones’ famous ‘Miramar’ mansion is built on the city block of Ocean Avenue in a site that was originally slated for a grand hotel; the landmark Miramar Moreton Bay Fig Tree marks the estate’s location today. Santa Monica’s famed pier, the only pleasure pier on the West Coast, opens to an international crowd of enthusiasts. Santa Monica is home to Hollywood “A-listers” and wealthy East Coasters; population soars to 37,000. Humorist Will Rogers acquires 345 acres in Rustic Canyon and builds a horse ranch and polo field for fellow players that included: Spencer Tracy, Robert Montgomery and Walt Disney. William Randolph Hearts builds Marion Davies a palatial, Georgian-style mansion on Will Rogers State Beach. Muscle Beach ignites an international fitness craze on Santa Monica State Beach. Santa Monica inherits Will Rogers’ 345-acre State Historic Park. Santa Monica becomes a hotbed for world-class dining; the iconic Michael’s restaurant opens and becomes a pioneer of California cuisine. Third Street Promenade opens, welcoming up to 7,000 visitors daily. Massive beachfront redesign marks the millennium, including the rebirth of legendary Muscle Beach, renovation of Palisades Park and debut of two new beachfront hotels, the last properties to be built along Santa Monica’s shoreline. 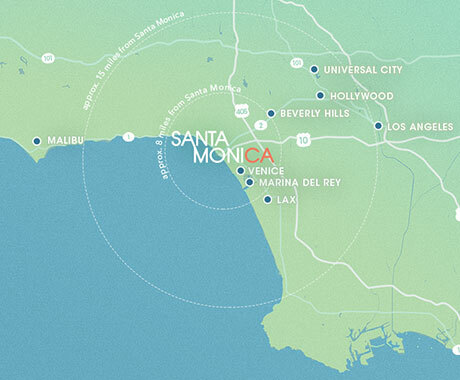 Santa Monica Travel & Tourism celebrates its 25-year anniversary. The Santa Monica Pier celebrates its centennial anniversary. Santa Monica Place reopens after an extensive remodel as one of the top luxury malls in the country. Tongva Park, a seven-acre park with majestic views of the Pacific Ocean, opens in the heart of Santa Monica. Santa Monica launches its Breeze Bike Share program, the first-ever bike sharing program in the Los Angeles region. Metro’s Expo Line light rail 6.6-mile extension to downtown Santa Monica connects Santa Monica to greater Los Angeles by rail for the first time in over fifty years. The new, adjacent Colorado Esplanade opens concurrently, connecting the Expo Line Downtown Santa Monica station to the Pier, Ocean Avenue and Palisades Garden Walk Park.